The Nero d'Avola Santa Cecilia Planeta is without doubt one of the best wines with the grape Nero d'Avola. 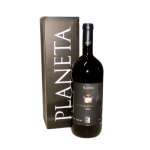 A lengthy search of the best place to have a great wine with this grape variety has led Planeta in Noto, the southern tip of Sicily and is situated near Avola. From the beauty of this terroir and meticulous work in the winery was founded Santa Cecilia, a wine that is an expression of elegance, power, balance and exaltation of the unique fragrances of Sicily.